After a month long break, we're back to our monthly SRC reveals and that makes me very happy. This month onwards, we in group B have a new hostess, Suzanne of Thru Bugs on my Windshield. If it wasn't for the wonderful idea that Amanda of Amanda's Cookin' had a while ago, we wouldn't have been here in the first place. I can't wait to share this months assignment with you. I was assigned Heather's lovely blog this month, Join Us, Pull Up a Chair. What a warm, welcoming name, isn't it? Hi Heather!!! And I tell you you should listen to her. When you stop by you'll be spoilt for choice. She has so many wonderful recipes there, I had the hardest time trying to pick one for this months reveal. She has the cutest little helper, Madeline who makes guest appearances every now and then. Do stop by. There's something for everyone. For this month's reveal, I picked a classic, the Oatmeal Raisin Cookie and yes, this was my first time making an oatmeal raisin cookie. I know, where have I been all this while? Stuck under a rock, I think! :) Anyway, I'm glad I finally got around to trying these because these were awesome. The oats keep you going for a while, the raisins in it are just yummy and there's cinnamon in it and that's always, always a good thing. My brother who'd come over a couple of days after I whipped these up, couldn't stop even after wolfing down a few. He actually had me take them away, warning me that I may not have another one left if it was upto him. They were seriously that good. I love how you have the option to leave them soft and chewy or make them a little more crisp, based on how you like your cookies. They tasted better the next day - it seems like the flavors had time to come together overnight. Even though this recipe makes a huge batch, I'm down to my last 2. My husband being the chocoholic that he is, thinks I should thrown in a few chocolate chips the next time around and I just might. Thanks Heather for sharing this wonderful recipe. It's definitely a keeper. In a bowl, combine the flour, baking soda, salt and cinnamon powder and keep aside. In another large bowl, beat the butter, sugars, eggs and extracts well until blended. Gradually add the flour mix to the wet ingredients stirring to incorporate. Lastly add the oats and the raisins and mix well to make sure they're well distributed through the batter. Bake for 7-8 minutes for chewy cookies or for 9-10 minutes for a more crispy version. Cool on the baking sheet for a couple of minutes and then move the cookies to a cooling rack to cool off completely. Store in an airtight container. Don't forget to check what the rest of the group has prepared for today's reveal. So glad you and your family liked them Trisha! They're one of our favorite cookies and I always seem to have the ingredients to whip up a batch! There is nothing like a good oatmeal cookie. Yum. That is a lot of cookies, but when they look that good, I don't complain! Oatmeal raisin are my FAVORITE! Everyone else like chocolate chip but I'd take these anyday! 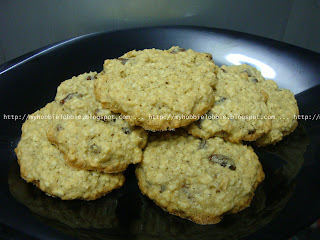 Oatmeal raisin are some of our favorite cookies ever... never tried a bad recipe! I hope you'll stop by to see my SRC Giant Chocolate Toffee Cookies. They sound delicious ... hopping over right now! Thanks for stopping by! Though I love oatmeal raisin cookies, I never make them. I need to change that and give this recipe a try. I have some cranberries that I will try next. Thanks for the suggestion Betsy. I love oatmeal cookies! I've made them with cranberries and chopped dried apricot. Glad you finally took a chance on making Oatmeal cookies! How were you able to get replies to your comments?? I haven't been able to get any help on it. When I click on reply, nothing comes up. Thanks for stopping by Vivian. Strangely I didn't always have the option of replying to individual comments, but a couple of weeks ago the "reply" option started showing up! You could try checking the "Help" section on Blogger to see why you can't use it. If I come across any information, I'll send it across to you! Thanks Matt, I've submitted this to your blog hop. Never thought of adding cinnamon to oatmeal raisins cookies. I'm curious, definitely going to try your recipe! Thanks for stopping by Margherita, the next time I make these I'm going to try them without the cinnamon though :) I'm eager to see how it turns out!